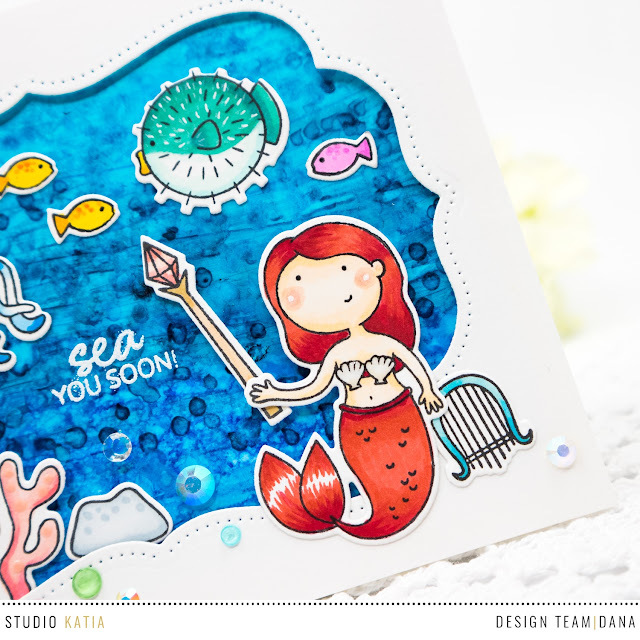 Hello and welcome to the Studio Katia 2nd Anniversary Blog Hop Day 2! You should have arrived from Crystal Thompson 's blog, or if you get lost you can find the full hop list below or visit Studio Katia Blog. Studio Katia is celebrating this Anniversary with a New Release. Their May 2018 release includes 6 new Clear Stamp Sets and 4 sets of Coordinating Dies, 4 new stand alone Creative Dies, 2 new Stencils and new Embellishments. And I bet you'll be in love with them as much as I was! Ok, it's time to get to my card. I tried alcohol marker coloring on the Yupo paper for my first time in today's card. 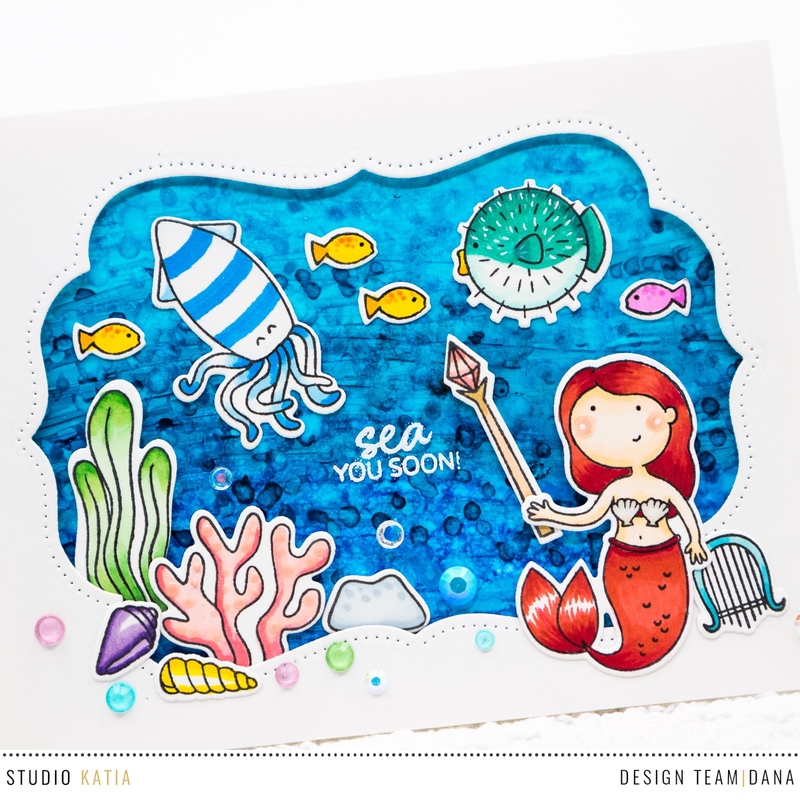 To start, I stamped images from Studio Katia Under The Sea Stamp Set and Mermaid For Each Other Stamp Set with copic friendly black ink. I colored them with copic and other alcohol markers and cut them with coordinating dies. After die cutting the images, I applied white gel pen and Spectrum Noir Sparkle pen to some of them. I added Nuvo Crystal Drops Morning Dew and Bubblegum Blush where I wanted them as well. I pulled out new-to-me Yupo paper from Ranger and drew wavy lines using alcohol maker's broad nips. I then spritzed ethanol using a mister on it and added small dots using markers while the panel was still wet. It made unique texture for my background and I love how it turned out. I created cover panel using Studio Katia Dotted Patterns: Darling Ribbon Dies. I popped it up on an A2 sized white card base using foam tape. I also mounted all elements as shown in the picture using foam adhesive and glue tape. I also adhered newly released embellishments. I used Studio Katia Spring Gems and April Crystals. Aren't they so beautiful? To finish, I white heat embossed the sentiment from Studio Katia Under The Sea Stamp Set. 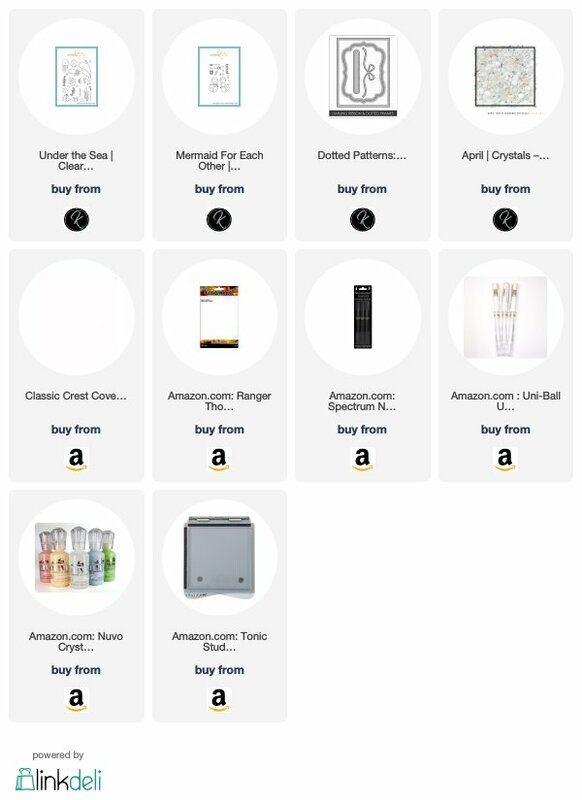 I'm sharing a listed supplies I used today and new release products. 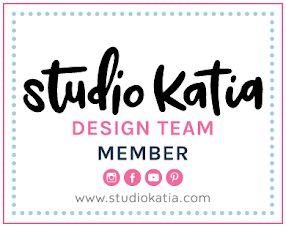 I'm a part of Studio Katia affiliate program and if you shop through these links, I'll get a small commission without extra cost to you. Thank you in advance for your support. - Make sure to leave all the comments by Saturday, June 2nd, 2018 11:59 PM EST. I'm giving away $20 CAD gift certificate sponsored by Studio Katia:) One lucky winner will be announced on June 3rd, 2018 on my blog. Be sure to check out 'Studio Katia' label at that time. - Tell me about it in your comment. 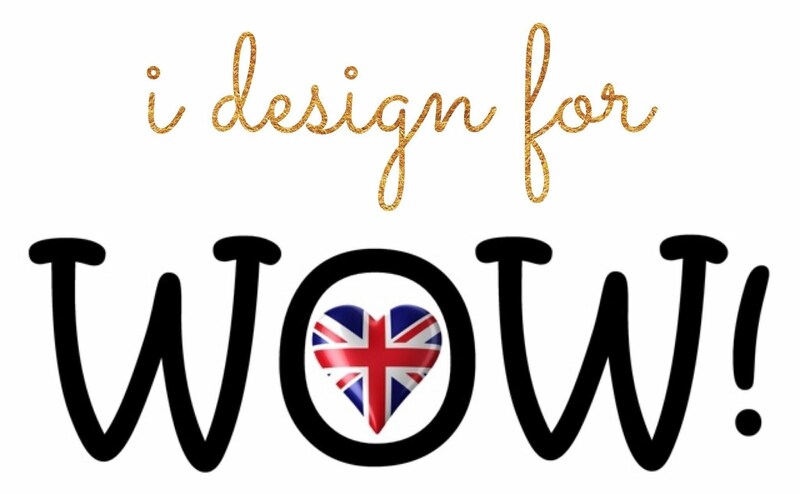 Your next stop is amazingly talented Erum's blog! Happy hopping! Great card, love your background. I love how you colored the little sea vegetation! I just followed you on Instagram and signed up for your blog! You are VERY TALENTED! Awesome card! I love how you framed your ocean scene. I love this scene card, amazing technique! Great job on your background! Great card! Really cute cards. the water back ground is wonderful! Wonderful bright and happy colors! Your background is amazing and I crack up every time I see that adorable little puffer fish! Thank you. This card made me smile a big smile. Fantastic background for your first try, and you even heat embossed the Yupo which is very difficult to do without warping. Adorable card! I love all the coloring you did and the background is beautiful! Such a happy card! Love the background!! I really like the use of the Darling Ribbon Die as the window! The under the sea set is adorable! Such a sweet ocean scene! Love these new images! I love your coloring - The blue striped squid is such fun! What a fun and colorful card. Very cute card, love your design! Love the bright colors you used to create your underwater scene. Great card. What a cute card! I love that watery background! Fabulous card!! I LOVE this ocean set!! Beautiful card! Absolutely love the color! What a fantastic card! Love the awesome background you created! Love your background. Really works well for this card. The copics on yupo paper look great! Your sea-themed card is very cute! I love the colorful gems and the fish! Thank you for sharing a sweet card. An aquarium in a card! Just wonderful creativity! DAna you created a wonderful scene here. Your alcohol marker blending is beautiful. You really did a great job. This card is so great and fun! Wow!! Such a wonderful card..Love it totally..
What a sweet under the sea scene. 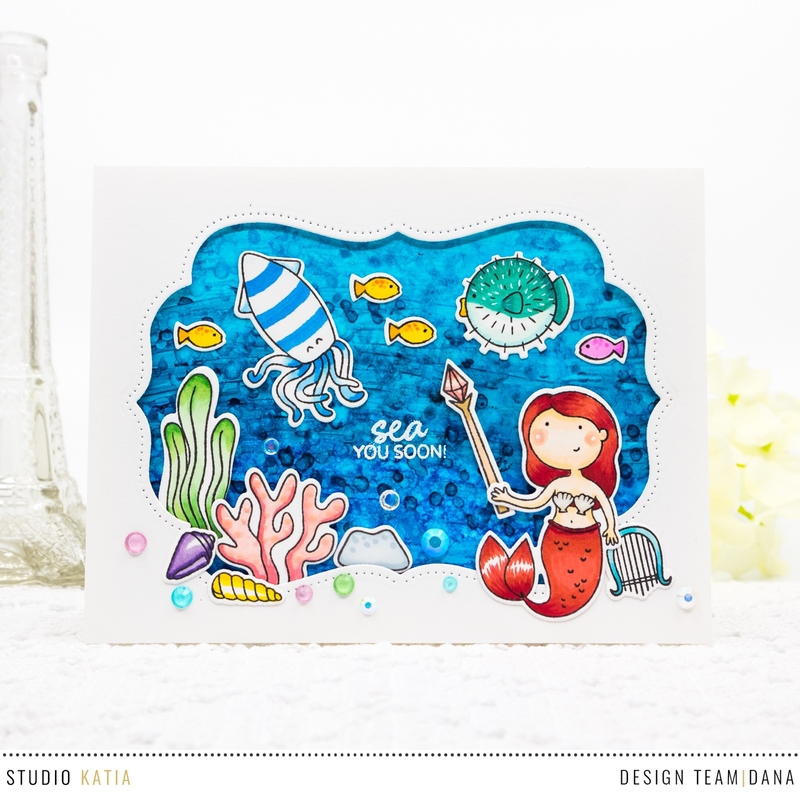 Love the images you used to create the underwater scene on your card. I love how you did the background, great idea. And your puffer fish is spot on, so so cute. Just a great underwater scene. Fabulous card! Love how you colored the squid and puffer fish! So much fun! SQUEAL!! 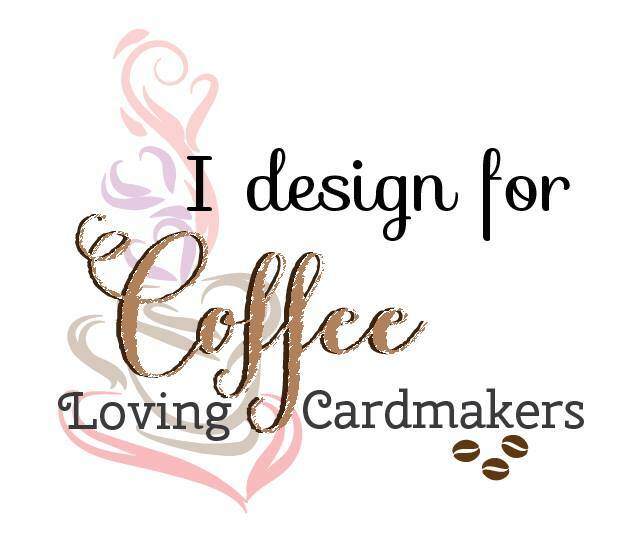 LOVE LOVE LOVE your FUN Card!! SUCH an AWESOME Design!! THANKS SO MUCH for sharing and hope you have a FABULOUS Memorial Day WEEKEND!! Love the vibrant colors! And the background is gorgeous!! Trying new things is what it’s all about! I signed up to follow your blog! What a pretty scene you've created with this adorable new set! Darling underwater scene you created! Love the colors and details, and the mermaid and sea creature stamps! I am a new follower with Blogger, and I am an IG follower (@denisebryant2143). So cute Dana. I am a new subscriber to your blog now too! Such a lovely card, I love all the fantastic details! Oh my!!! This is stinkin’ cute!!! This is just fantastic!! Love all of your detailed coloring- it just brings this card together beautifully! P.S.- Just started following your blog and instagram! Can't wait to see more beautiful things from you!! Wow your card is gorgeous! I love the water background you created and the way you coloured all of the stamped images. Such a fun card! What a gorgeous background! Perfect for the under sea scene! Thanks for the inspiration! Dana, I'm absolutely smitten with and crushing over your underwater scene, rich with adorable images, yummy texture and all-around charm! I follow you via Feedly and IG...your talents always always always delight and inspire! A perfect match up of the two sets, Mermaid's & Under the sea!! Using the Darling Ribbon die cut and the April crystals was ingenuous and really made the card even better!! Love your work and am your follower! Love the aquatic themed stamps, that puffer fish is too cute. What a wonderful window card. 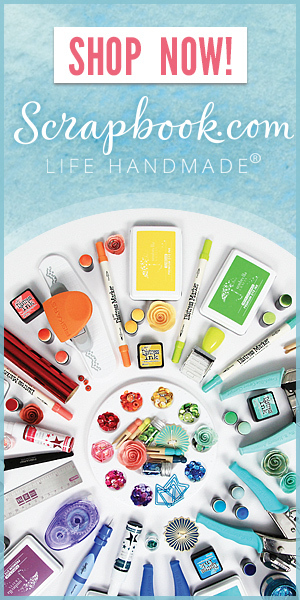 Love your bright colors - that striped squid gave me a giggle! So cool what you did with the alcohol inked background. Thanks for sharing your talent with us. I really like your card and the scene you created. It is so fun and whimsical. Can't remember if I have already left a comment Dana... I love this card. The underwater scene is perfect as are the colors! Just Beautiful! Your card is adorable and the embellishments are gorgeous. Nice work. Hi Dana, Your card is super. Vibrant colors. Love the color you chose for the Mermaid. Thanks for sharing and the inspiration. Love the frame around this gorgeous creation & the background is amazing! Thanks for sharing how you colored it. Awesome card!! Such a cute underwater scene! :) Followed your blog. What a sweet underwater scene! I like that you combined the two stamp sets. They work so well together. Your background panel is beautiful, as is your coloring! Great card and I love the dimension you created! 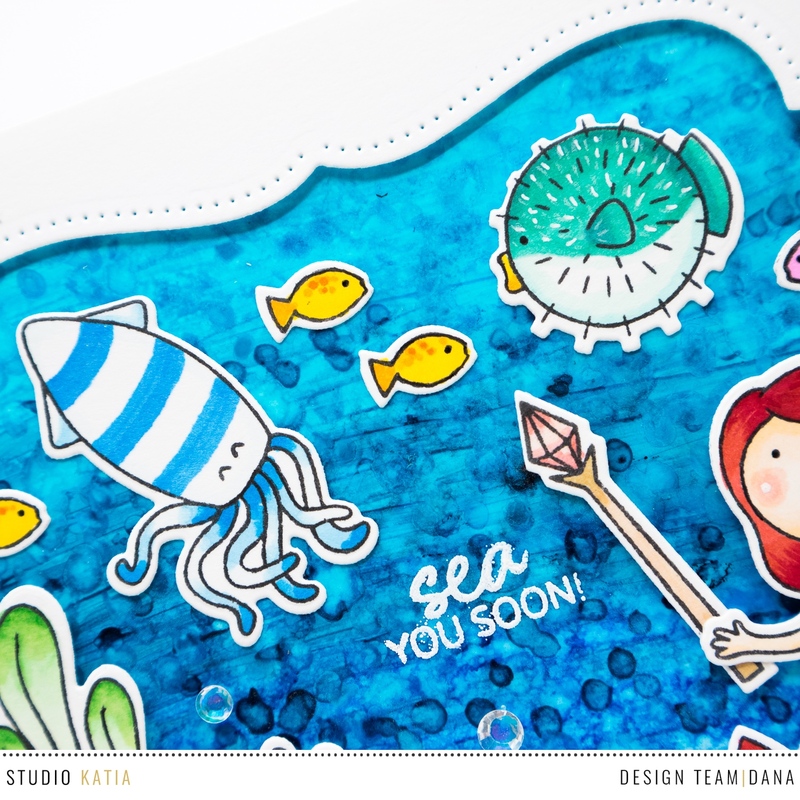 Such a fun sea scene! Oh my !! You’ve made such a lovely underwater scene !! I love your beautiful background/ocean and all the bright colours you choose. Such a cute and pretty card..love the mermaid and the fun sea creatures. Gorgeous and fun card! Such amazing depth of color. Your first Yupo paper design was a success in my ocean! Love the tiny details you added to your card and I like that the mermaid was red. How fun!!!! What a cute scene! Love the detail on the frame. I followed your blog through Bloglovin and I love how the Yupo paper turned out! Beautiful! Fantastic card! Your background turned out awesome!!! This is such a cute scene. Love the detail and bling. Definitely the most beautiful mermaid card....can't take my eyes off!! Beautiful job! I really love the stripy squid. So stinkin' cute! TFS! This is such a sweet scene. I'm already a blog follower.